The LA Unified board meeting on June 17 might be more crowded than usual. 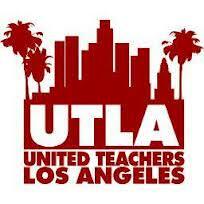 UTLA, the teachers union, is planning a noon press conference outside the district’s downtown headquarters and handing out leaflets to call attention to the board’s demand for “a fair pay raise” for the coming years. The union’s activities come at a precarious time. The 2014-2015 budget is almost complete, pending a final review and vote by the board, which is scheduled for June 24. At this point, the district has offered the teachers a 2 percent raise for the academic year just ending, and another 2 percent for the coming year. By contrast, the union is demanding a 17.6 percent increase over an unspecific number of years. The distance between them and the number of days left before the budget has to be completed, about two weeks, suggests that teachers might begin the new school year under salary terms of the old school year. The board is allowing 30 people to appear at the meeting to argue their case. If enough union members get there in time, they can grab all the slots.